I had lots of fun making this card for my sister for her birthday. I pulled together lots of tips and tricks I've picked up lately on making shaker cards. I also had some trial and error while making this card. I started out by creating the card front on my Cameo. I drew a 3.75" x 5" rectangle first and then grabbed a simple butterfly silhouette from my stash of svgs. I placed that at an angle near the top of the rectangle and cut it out of white cardstock. I've picked up a tip from several crafters to use fun foam as the base behind your shaker to give your card a more substantial feel and to help make sure your shaker stuff stays where it's supposed to. I tried just cutting the same shape out on my Cameo but I learned that you can't cut fun foam with your Cameo. So...I ended up laying my base on top of the fun foam and tracing it with a pencil and then cutting it out by hand. Just make sure you cut everything a tiny bit larger than the opening so it doesn't show when you glue it all together. Also, trace your design using the backside of your card front just in case your pencil slips like mine did. Then I adhered some plastic I had leftover from some packaging (always save the plastic!) and used distress ink in peeled paint to give it some color. Here's another lesson I learned - don't adhere the plastic until you've finished your inking. 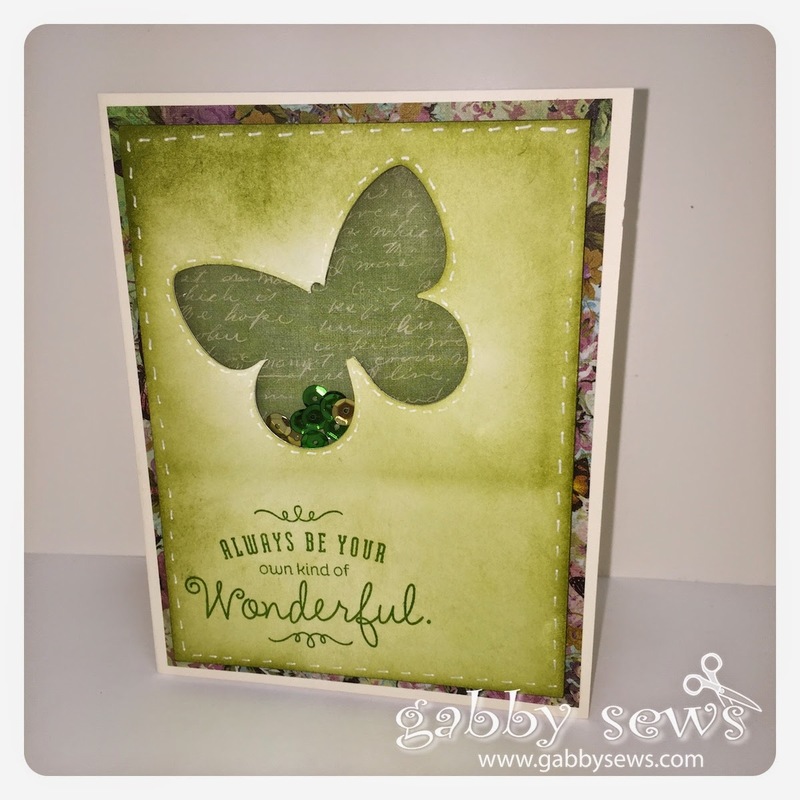 I stamped the sentiment in Topiary ink and drew some faux stitching around the edge of the card and the butterfly. I glued the fun foam to the back of the card piece. Then I laid my sequins down on a piece of patterned paper and glued it to the fun foam. Then that whole piece was glued down to another piece of coordinating patterned paper. I then glued that whole thing down on a Colonial White card base. There are lots of tutorials on YouTube if you've never made a shaker card before. My favorite YouTubers would be Jennifer McGuire, Sandy Allnock, and Kristina Werner. You won't go wrong with any of them.